Mountain sports are usually associated with risk, adventure, physical strength and excelling oneself. For most people, these features seem to be related almost exclusively to men. Nevertheless, many women are challenging this idea and taking their own place in the mountain, either as professionals or amateurs. Despite that, the public opinion still consider them more as an exception than something ordinary. 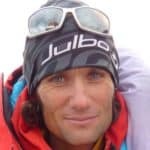 We discussed this subject with Tanya Naville, a French sport-woman and a ski mountaineering athlete who writes a specialized blog about mountaineering, and who is involved in the French Alpine Club for more women in mountains. Some of her thoughts are a part of this text. It’s a fact that there are fewer women than men in ski mountaineering competitions and also as certified mountain guides. But things are slowly changing, as women are stepping with strength into the mountaineering world, which has been long stereotyped as a ‘men world’, although with some remarkable exceptions. Tanya Naville, for instance, is a mountain lover from France who enjoys practicing all kinds of sports. She coordinates mountaineering groups for women for the French Alpine Club and organizes the ‘Grand Parcours’, an event around mountaineering in Chamonix. But most importantly, she is an activist on the female role in mountain sports. Through her specialized blog (‘On n’est pas que des collants’), she encourages women to practice sports in natural environments and updates the most relevant news on this topic. At Explore-Share, we also try to help people to achieve their goals in the mountain and enjoy these sports. 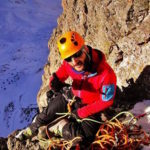 To do that, we offer access to qualified mountain guides from all over the world. Actually, there are excellent female guides in our community. Julia for example, is an aspirant guide from France who loves taking her clients off piste skiing in Serre Chevalier. Isabelle, an IFMGA certified mountain guide based in Chamonix, organizes ice climbing courses in Cogne just for women. Luciana, from the Argentinean Mountain Guide Association (AMGA), guides her clients around Bariloche, her home town in Patagonia. And Hiroko, a Japanese guide, enjoys very much sharing with her clients a unique experience in the mountains of Minakami. ‘the mountain is much more than excelling oneself. It’s an attractive setting, a majestic environment, so special that after having tasted it, we can’t give it up’. We need great stories about the beauty of practicing sports in the mountain. About the feeling of discovery and the deep sense of achievement when climbing or skiing down a mountain. And for that, of course, it doesn’t really matter whether you are a man or a woman. 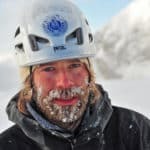 Media coverage often glorifies the extreme side of mountaineering and the fact that you need physical strength to practice those kinds of sports. ‘Stories about avalanches and tragedies or about sleeping in the freezing mountain without equipment, only tend to scare people out’, explains Tanya. Furthermore, they create a wrong feeling: that high risk sports are only for a few. Besides, she points out another important issue: ‘there’s the idea that a woman practicing sports in the mountains is not only risking her life but she’s also leaving aside her family. This is certainly not perceived in the same way when it comes to men. On this basis, how do you expect us women not to feel guilty when practicing a high-risk activity?’. It’s necessary then to notice these underlying messages and to start sharing stories that truly encourage all people (families with children too!) to practice mountain sports. ‘You don’t need to be incredible strong or climb like Spider Man to reach a summit. Everyone, with their own skills and personal life, can (and should) have extraordinary adventures in the mountain’. According to Tanya, ‘the number of female guides in France keeps increasing and mountaineering groups of women are more than acclaimed; girls want to become autonomous in the mountains’. Of course, not everyone wants to become Catherine Destivelle or Chantal Mauduit (two famous French climbers). Some people just want to practice mountain sports as a hobby during their holidays or weekends. The mountain offers different options for every woman: ‘you just have to find a sport that reveals your skills’, says Tanya. It may be ski touring, multi-pitch climbing, rock climbing or ice climbing. In the end, the important thing is to give yourself the chance to try. Still not convinced? Then you should read the story of Marine. She’s a young French woman who experienced mountaineering for the first time last summer. She climbed Castore Peak in the Monte Rosa range, together with a mountain guide. ‘Until last spring, I thought climbing any summit was like climbing the Everest or going to Mars’ said Marine after coming back from her Italian adventure. Marine and her boyfriend on the summit of Punta Castore in the Monte Rosa range last summer. Being in the mountain creates a world apart, a distance between everyday concerns. At the same time, it gives a fresh perspective towards life. An expedition to the mountain is also about team work and friendship. No matter what role you play in everyday life. Because above all ‘we are just part of an indivisible rope where everyone has to rely on the others to reach the summit’, says Tanya. And we couldn’t agree more. In 2017, Tanya will launch an amazing project: Women’s skimo project. She’ll meet women from all around the world who practice ski touring and ask them about it. Then, she will create a movie and a web series in order to talk more of women in mountains. We love this, as it will inspire many others to give it a try and live amazing adventures. We will keep you posted on this. Stay tuned by following her Facebook page!